Recently we, the Pakistan Animal Welfare Society (PAWS), received a letter from a concerned citizen about the plight of Kaavan the lone African elephant in captivity at Islamabad Zoo. Kaavan was donated to Pakistan by the Bangladesh government 28 years ago. Chained for decades on concrete by all four legs up to 24 hours a day, he is made to endure a life of solitary confinement – considered one of the worst punishments for human beings in jail. It is enough to drive any sentient being to psychosis and is something visitors to the zoo witness on any given day. I happened to be in Islamabad for a vacation and happen to visit Murghazar zoo. I was astonished as well as sad to see that elephant was standing at one place throughout the time (I spent almost 45 minutes in the zoo) and his legs were all chained up. He was moving his head from left to right continuously and nor once I saw that he stopped. By looking at him the first thought that came to my mind was that he was drugged. He kept on standing to the same place without moving a leg. The only thing that was moving in his body was his head, from left to right.. it was a pitiful sight. It is my humble request that you may please ask for his recent pics from the volunteers of PAWS who live in Islamabad by posting the request on your webpage or whatever means you have got to communicate with the volunteers. Not just elephant, all other animals there were very painful condition, skinny and restless. We published the letter on our Facebook page on World Elephant Day. The response was immediate. Kaavan’s plight evoked sympathy from around the world. Questions arose as to why the Capital Development Authority (CDA) that oversees the zoo is so cruel to him. One concerned citizen created a petition demanding CDA free Kaavan and send him to a sanctuary abroad. The petition generated more than 53,000 signatures in just a few days. I came across Kaavan the Elephant while visiting the Murghazar Zoo in Islamabad, Pakistan. Kaavan was all alone, as he has been for the 28 years he’s been at this zoo. His legs were chained up to limit where he could move in his enclosure. But that didn’t seem to matter because for the entire time I was there Kaavan didn’t move. The only thing that moved was his head, as it bobbed repetitively from right and left, a behavior known as “weaving” which elephants adopt in response to stress and depression. He cut a small, solitary figure against the backdrop of his shed, it was a sorry site. Despite his obvious discomfort, the zoo claims that Kaavan is used to his enclosure and doesn’t mind it. Kaavan needs our help. If enough of us put pressure on Pakistani authorities, we can get Kaavan released to an elephant sanctuary. The global outcry has already resulted in the government ordering the zoo to remove Kaavan’s chains. Zoos such as this one rob elephants of their most basic needs. In the wild, elephants are active for 18 hours and roam up to 30 miles a day. They live in social herds, and form deep bonds with one another. Nothing even close is being offered to Kaavan at the Murghazar Zoo. There isn’t much time left, Kaavan already has gangrene susceptible gashes on his feet from the chains. Kaavan’s predecessor was Saheli, donated to the zoo by the Sri Lankan government. She died from gangrene and neglect. I don’t want the same fate to befall Kaavan, especially after a lifetime of solitude. It doesn’t have to. Together, we can give Kaavan the life he deserves. We signed the petition and called Capital Development Authority (CDA) Director General Environment, Dr. Suleman Shaikh. He committed to releasing Kaavan from his chains in a couple of weeks. According to him, a moat has been constructed around the periphery and the elephant will be allowed to roam free in his enclosure after a final check by the zoo authorities. He mentioned plans to upgrade the elephant enclosure as the current zoo was a makeshift arrangement. After the call, we had a look online and sure enough came across a report claiming to expand the zoo to 82 acres with an allocated budget of Rs. 1407.8 million. The Capital Development Authority (CDA) will add 55 acres of land to the Capital’s Marghazar Zoo to make new animal enclosures under the approved plan. The project “Development of Marghazar Zoo, Islamabad” costing Rs 1407.8 million has been divided into five packages. Package-I, including two animals’ enclosures, has already been completed at a cost of Rs 19.37 million while the remaining packages will be completed gradually with the availability of funds. Presently the design of the elephant enclosure has been completed and will be tendered out in current financial year. The design of lion enclosure and animal hospital is in progress. 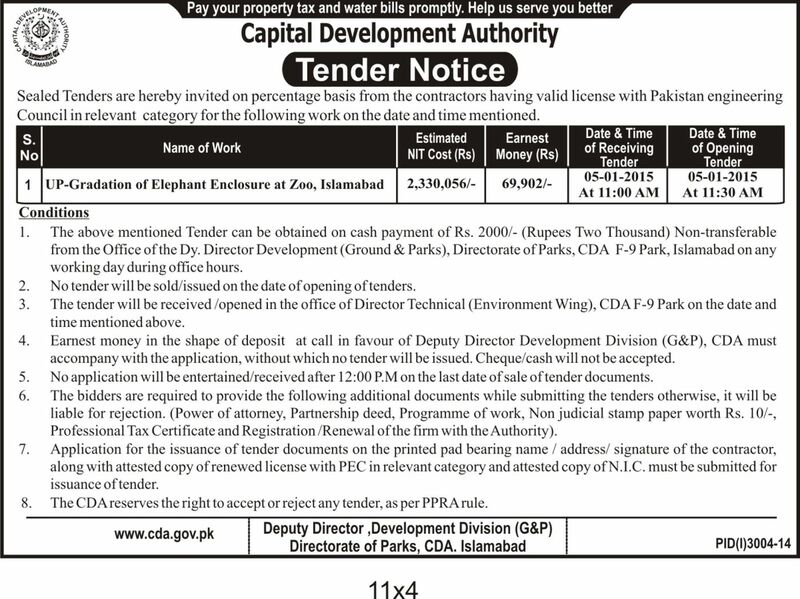 And on the CDA’s own website, we came across a tender floated in January 2015 for the upgradation of the elephant enclosure at a cost of Rs. 2,330,056. The recommended enclosure size for captive elephants should at least be double the size of a football ground, according to international experts. Whatever the CDA plans and budgets involved, Kaavan seems to have benefited from none of it. For him, it is still a life in chains. CDA does not have the heart to share even one of those 82 acres with him. In response to the petition and in a bid to pacify concerned citizens in Pakistan and abroad, on August 30th, 2015 CDA promised to free Kaavan and send him to a sanctuary. They put up a call for volunteers to make this happen and give phone numbers where they can be reached. CDA has decided to make a case for freeing the Elephant in Zoo. We need volunteers who can help CDA in placing “Kaavan” back to the sanctuary. All those willing to help may please coordinate with Director Zoo. We then called CDA member Mustafain Kazmi and tell him that we are calling in response to the appeal issued by their office for volunteers to help get Kaavan to a sanctuary. We guaranteed the funds if they surrender Kaavan to our custody. His response was rather surprising, considering we were only responding to his own office’s appeal. “Bilkul ghalath baath chal rahi hai.. (this is all wrong)” he said, implying that there is some confusion and the elephant is happy and cared for at the zoo. Another post was shared by CDA the next day politicising the issue of chaining Kaavan. They were clearly getting agitated at the attention a chained up elephant in their care was receiving. It’s heartening to see the response of international community regarding Kaavan the elephant in Marghazar Zoo. I wish they could share the same feeling about the humans they have killed in Middle East and FATA. Does it mean let the kids die under drones? And sure enough, to everyone’s dismay, the very next day they deleted their post about freeing Kaavan. They issued a counter statement and a video saying all was hunky dory and that we were all mistaken – Kaavan’s every need is being looked after very well by them. “The Kawan is feely moving in its enclosure”, claims CDA, in a video released by them on 2nd September 2015. And in a comment to their own post they claim “Excellent arrangement for free movement of Kawaan.” In the video Kaavan can be seen standing in one place, reaching out for tree branches with his trunk. It is unclear whether he is unchained or not, since his legs are hidden by a low wall. Meanwhile, the petition was updated. 5 Sep 2015 — Firstly, I want to sincerely thank you all for your determination and support of Kaavan. Because of your voices, we have found a sanctuary who may be able to adopt Kaavan. However we still have one obstacle left: the CDA in charge of our elephant does not wish to let him go. The CDA at first had claimed they would “move” Kaavan to the sanctuary. However, the very next day, they went back on their word and retracted their statement. They then issued a false statement and video claiming that Kaavan is “hardly ever chained” and happy in his in environment. However there are multiple eyewitness accounts, videos and photographs which discredit this claim. And so, the zoo continues to profit off of Kavaan. Perhaps the most devastating discovery we have made so far is that the CDA has submitted a request to Sri Lanka government to gain another elephant to keep alongside Kaavan. They wish to profit off the misery of yet another animal. But while we have clearly shaken the system, the work is still not done. We need to press hard on zoo authorities and on organizations whose job is to protect animals like Kaavan. – Continue messaging and commenting on the CDA Islamabad Facebook page to persuade them to let Kavaan go! – Persuade the government to establish a central zoo authority that oversees other zoo’s in the country and set’s acceptable standards. Again, please see Kaavan’s Facebook page for updates as well as an email template to send to Animal non profits. “Chairman has ordered the zoo management to follow standard and international protocols defined for the captive animals,” Suleman said. We demand justice for Kaavan. Pakistan does not have the space or expertise to look after elephants. This country is not their natural habitat. We are currently looking at avenues abroad for Kaavan to spend the rest of his life in a natural manner in the company of other elephants. Please sign the petition and write polite letters to CDA requesting them to free Kaavan and let us send him to a sanctuary abroad. Urge them to reconsider their decision of getting two more elephants from Sri Lanka. Please also hold CDA Director General Environment Dr. Suleman Shaikh up to his word for unchaining Kaavan immediately and let him have the run of his current enclosure. Whenever we go to your zoo in Islamabad to visit Kaavan the elephant, it breaks our heart to see him chained by all four legs, standing in solitary confinement in one spot, swaying his head from side to side, no matter how long we stand there watching him. Islamabad Zoo is robbing Kaavan of his most basic needs. Elephants are active for as much as 18 hours and roam up to 30 miles a day in the wild foraging for food. They live in social herds and bonding with each other is an intrinsic need. Living unnatural lives in captivity causes health issues and psychological distress, such as the incessant head bobbing displayed by Kaavan. Foot problems from unnatural cement floors is a leading cause of death for elephants in captivity. Your other elephant Saheli died three years ago at age 22 of foot complications. Like Kaavan, you kept her in chains as well throughout her short life. And now you plan on getting yet another elephant. We do not wish to have another Kaavan or Saheli. Saheli died in your care. Now please let Kaavan have the freedom to spend the rest of his life in a natural manner in the company of other elephants in a sanctuary abroad. Unchain him immediately as per CDA Director General Environment Dr. Suleman Shaikh’s promise. Upgrade his existing enclosure and order the zoo authorities to follow international standards for captive animal care. Keeping Kaavan chained day and night for the entertainment of our children neither serves to educate nor contribute to protecting the species in their natural habitat. Watching national geographic documentaries about elephants in the wild would be a far more valuable learning experience for Pakistani children. In recent years there has been a growing public debate around the world about the ethics of keeping elephants in zoos. Wild animals belong in the wild. They don’t deserve a life in captivity. They don’t deserve to be kept in chains. Even London Zoo, which had displayed elephants for 170 years, decided in 2001 that its facilities were inadequate and shifted its three Asian elephants to the countryside setting of Whipsnade Wild Animal Park. Given the plight of elephants in captivity, the Royal Society for the Prevention of Cruelty to Animals (RSPCA) in the UK published a report in 2002 that recommends the phasing out of elephant exhibits in zoos worldwide. Freeing Kaavan and sending him to a sanctuary abroad will do wonders for Pakistan’s soft image and will set an example for the rest of the world about showing compassion for all sentient beings. Do also send your letters to editors of leading newspapers in Pakistan and abroad about Kaavan’s plight in captivity and the ethics of keeping elephants in zoos. You may also contact the international BornFree Foundation. They respond to cases of individual animal suffering and intervene with foreign governments to step in and take action. There are also other international organisations that can be reached through a simple google search. Someone please volunteer to put a list together. We need to reach out to all of them. And if you live in Islamabad, please go to the zoo and share your photos and videos of Kaavan on social media. Let the world know about his plight. Keep posting on CDA’s Facebook page urging them to free Kaavan. He cannot speak up for himself. Your voice can make a difference. Use the hashtag #FreeKaavan and don’t give up. Thank you. It is a great relief to know that Kaavan is starting to get the attention of those that may be able to really help him. Thank you for sharing his plight with the world. We hope to be able to help him live the rest of his life free and in dignity. There are several other elephants in Pakistan in a similar condition. One day we shall be able to help all of them. Please influence as many people as you can to help in moving this along. Young people of Pakistan should stand up to say Enough is Enough. I hope the young people of Pakistan can see that this is a new world where animals need to be respected and cared for in the ways they deserve. Keeping Kaavan chained and in solitary confinement is unconscious and old world. Please stand up for this sweet sentient beast who has done nothing to deserve such a life. Can we try and do the right thing? PLEASE THIS POOR ELEPHANT NEEDS TO GO TO A VERY GOOD SANCTUARY NOW . At last there is a little hope Kaavan may be released to a sanctuary.We must not give up the plight for this poor lonely elephant.At least the world is watching an this may help better conditions. Thank you, Paws Pakistan, for working so hard to end Kaavan’s misery. I read from the petition update that the chains have been freed but he urgently needs to go to a sanctuary, and I’ve written to CDA to ask that this be done. Thank you so much.Kaavan deserves to be taken to a sanctuary. THIS POOR ANIMAL WAS CHAINED FOR YEARS. HE MUST BE FREE DID FROM THIS ZOO. Kaavan needs to go to a good sanctuary Remember a country has measured intelligence by how their animals are treated written by ghandi you people are a disgrace restore your honor send kaavan to a good sanctuary !!!!!! If I am not mistaken PRIME MINISTER NAWAZ SHAREEF ISSUED ORDERS some months back for suitable relief measures after which for starters we saw Kavaan in a smalll pond near an open area . Even that was all EYE WASH .Is this how much the PM’ s word counts?. the elephant is still in chains…i talked to the zoo staff and they said it was released for some time but is now back in chains…i have witnessed this today. please do something. i have contacted both the born free uk as well as peta. You can post on this CDA site…and there are lots of posts for Kaavan under their post about the new so called safari park post dated 1 March 2016 https://www.facebook.com/CDA-Islamabad-103776686486059/?fref=ts He is now chained all night and most of the day in spite of a CDA order that he was to be chain-free between hours of 9am and 4pm. His keepers Bilal and Jamil ignore this order as does the zoo Director. If you visit the zoo and he is chained, please ask the Director to unchain him as per CDA order. Lots of posts from overseas, Kaavan needs voices from Pakistan to help him. See also twitter page for Kaavan #FreeKaavan tweet and resend tweets. tweeting every day now. If you know of anyone please add tweet addresses here, and we will tweet them too. We must stop the CDA getting another elephant and 2 lions they say in this article of 16 May 2016. http://www.thefrontierpost.com/article/389666/#.Vznhl8bRb9M.facebook Thank you for the media and Born Free contacts, will do that. Lots of people around world are concerned and acting…join. I am on FB too if you want to link up – https://www.facebook.com/carey.ostrer. you can send me a message. Update 18 November 2016. on 25 July 2016 the Senate Standing Committee made the historic decision that Kaavan should be transferred from Islamabad/Marghazar Zoo to an international sanctuary for the rest of his life. On 30 august Senator Talha, Chair of the Standing Cmt issued a statement on social media saying that he was disatisfied with the lack of progress for arrangements by Islamabad officials – the CDA – to get on with the transfer arrangements and requested they do so. A great deal of paperwork has to be done, CITES has alist of them, for transferring an elephant across international borders, including a thorough health check and adequate transport. We have so far heard nothing and have no way of knowing what is happening on that regard. Especially worrying is the wall of silence that has come down since a volunteer who was regualrly going to the zoo to film the animals including Kaavan was banned from the zoo and faces police charges for ‘disturbing the animals especially the elephant Kaavan’. When he and Journalist Mian Umer attempted to film Kaavan around a month later, they were assaulted by Jamal (brother of head Mahawat Bilal) and a new zookeeper pushed to the ground and verbally abused. All was captured on film. We were informed by the Mayor Sheik Anser Aziz after the assault, that he was surprised to see Bilal involved because he understood Bilal was transferred pending enquiries, however we believe that he is still very much at the zoo and very much still in control, even if not physically in Kaavan’s enclosure. Additionally Kaavan’s Musth period is approaching, history tells us that he will be chained again 24/7 for the duration of Musth due to the totally inadequate security of his enclosure. We consider that this act of closing down live filming of Kaavan is the latest attempt by Managers in Islamabad to stop the success so far achieved. The live footage, which was a weekly event, was very powerful, and captured the hearts of Kaavan’s supporters and enabled decsision makers in the Senate to see for themselves the pain Kaavan went through. We send out a heartfelt plea and humble request that people in Islamabad go to the zoo and film Kaavan, even short videos by mobile phone is very imprtant, and take notes saying what Kaavan was doing, where in the enclosure he was, whether he was chained, whether there was evidence of fresh drinking water or fresh water in his pool, and which Keepers were present, so that we can publish online. All will be kept stricly annonymous if this is required. Please contact by private message to Facebook accts Carey Ostrer, Anika Sleem, or Animal Welfare Worldwide.